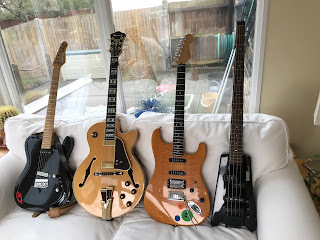 The fabulous Mo-Bo Duo (me n Rich) are working on a brand new project, can't say too much at this stage but for some gigs we'll become a 3 piece. Expect new tunes as well as the regular standards, blues, bop funk n pop folks like us to play. Also a new recording is planned and a new residency is likely in mid Autumn. 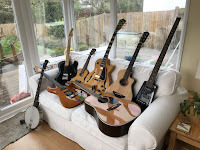 I'll be introducing a new guitar lesson pathway in the early Autumn, called Fretboard Navigation, to help budding guitarists find their way around the guitar fretboard. I've mulled over how to teach this skill over quite a while now, with bits of it often being drip fed to my current students. I've decided it should be it's own a specific pathway with set outcomes. It will also feature videos and an eBook as backup resources... so... watch this space! 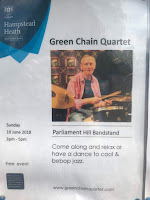 Meanwhile in the Green Chain Quartet, we are working on some new tunes to our extensive blues/jazz/boogaloo repertoire which will add to the fun. We'll be back at BNN's in the Autumn and talk of a possible new residency in SE London.